Local rock band Social Intents recently finished shooting for the new music video. 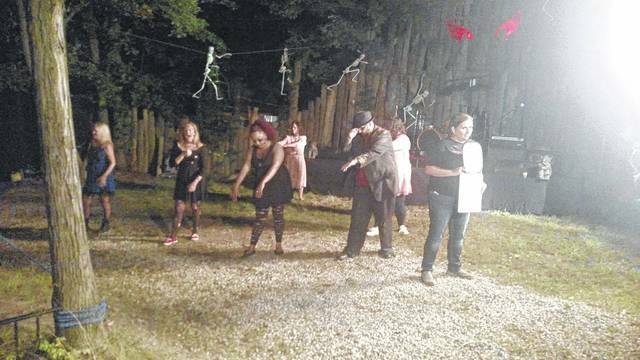 Community members volunteered to join the band on set as zombies and dancers. The official release is set for October 21. It’s close to midnight and something evil’s lurking in the dark. Under the moonlight you see a sight that almost stops your heart. You try to scream, but terror takes the sound before you make it. You start to freeze as horror looks you right between the eyes. You’re paralyzed. It’s the “Thriller,” and it’s being done by local band Social Intents. 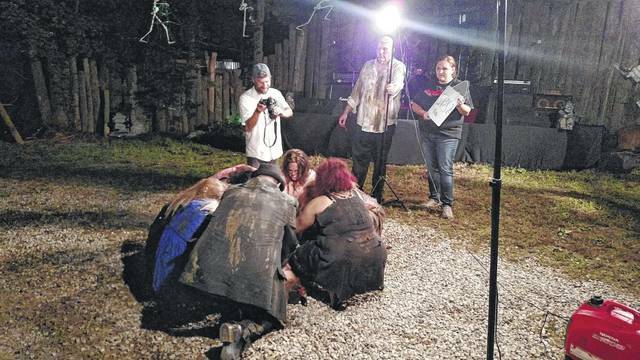 Social Intents spent the weekend having some fun shooting their new music video, which is shot at Terror in the Trees in Lucasville. Guitar player, Jeff Horner explained that the group decided that when there is nothing fun to do, you make your own fun. And, they invited the community out to take part as zombies, mimicking the Michael Jackson hit. Horner explained that the community really stepped up to help. They had dozens of zombies show up for the zombie horde. He added that he really believes so many people got involved not only because the band has a lot of friends and support, but because of the zombies. Horner explained that the concept really came about after shooting a pool party video for Social Intents’ cover of Katrina and the Waves’ “Walking on Sunshine.” At the end, of that video, the band had planned on killing their lead singer. However, because of some issues they found being new to shooting videos of that magnitude, it didn’t happen. “We learned a lot from that video,” Horner commented. Social Intents started looking for another opportunity to do so and Horner’s wife Stacy suggest “Thriller.” The band has been working on the music video for nearly two months and are now officially done shooting and completing the final phases of the project. “There’s still a lot of work to be done,” Horner said. Social Intents consists of Jerry Allen on guitar, Sean Frazier on vocals, Brandon Adkins on keyboard, Pat Tim Day on bass, Jeff Horner on guitar and Bobby Hunt on drums. Joining Social Intents in the making of the video was their significant others; camera people, Brian Smith and Melissa Gampp; tons of dancers that spent a month learning choreography; and sponsors, Nancy’s Country Kitchen in Lucasville (who provided hamburgers), Patsy’s Inn and Jason Whisman (who provided shirts). 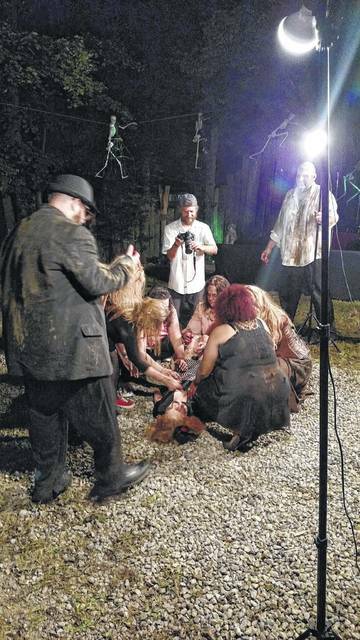 Horner added that he had a great experience working with the people at Terror in the Trees. The music video with have two release parties. The Wheelersburg Cinema is doing a release at 11:30 p.m. Friday Oct. 20; however, the video will not start until after midnight because the release date is Oct. 21. The official release will be at Terror in the Trees around 9 p.m. Saturday, Oct. 21. Horner explained that the time may change. All information will be updated on social media. Terror in the Trees will open for their regular haunt season the last weekend in September. They too have updates on Facebook as Terror in the Trees Haunted Attraction.